Professor Jeffrey Langford is a professor of music history and assistant dean for doctoral studies at Manhattan School of Music. 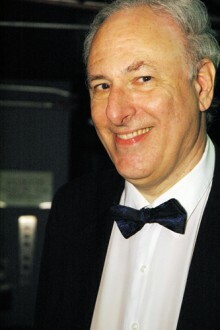 He also lectures at the NY Metropolitan Opera, and have written a couple of books on Hector Berlioz and opera. Let’s get right to the point: What is a musicologist? A musicologist is someone who studies the history of music, usually in some very specific way. My expertise, for instance, is the music of Berlioz and 19th century opera. One of the practical functions of musicologists is that they help produce accurate editions of music scores that performers can use. 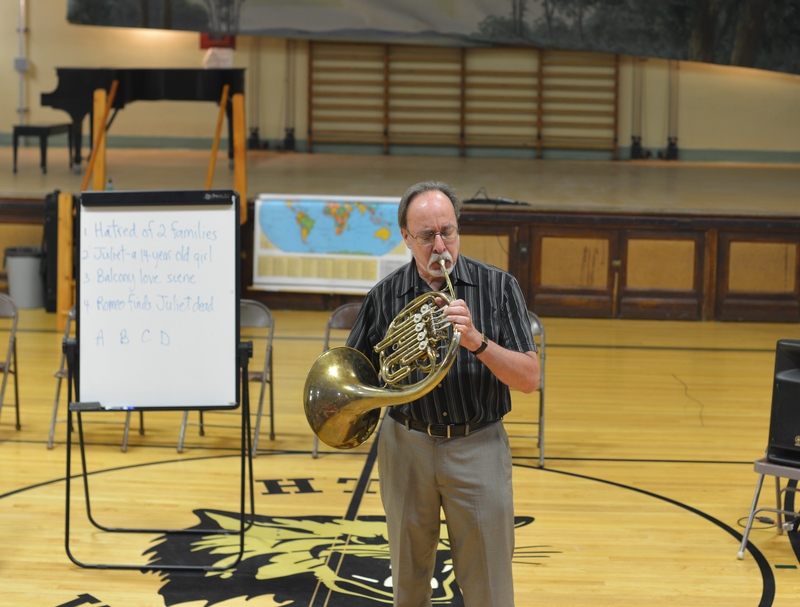 Even when I was a young performer of the French horn, I was always interested in the historical background that lay behind the music I was playing. Eventually I decided this was a more fruitful career path for me than playing the horn. When did you start working for the Manhattan School of Music? I started working for MSM in 1982! Before that I taught yrs. at Skidmore College in Saratoga Springs NY. What is Manhattan in the Mountains? 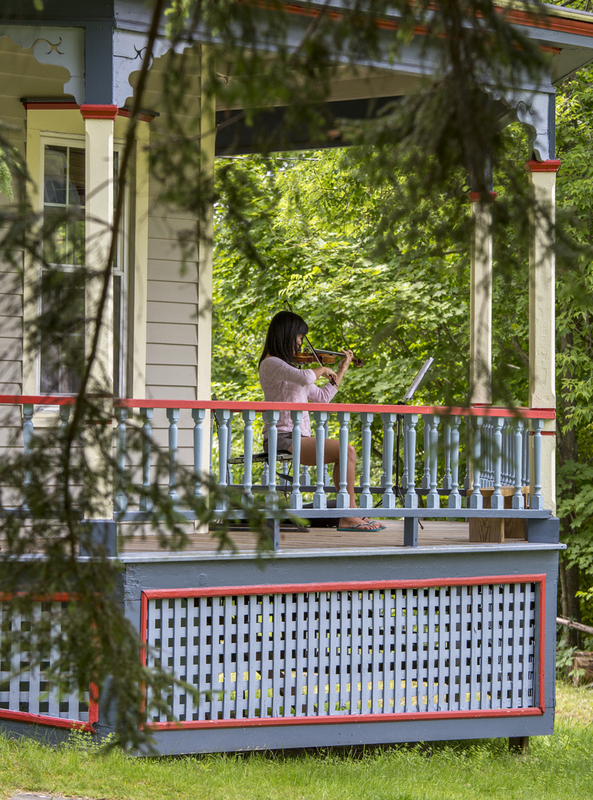 Manhattan in the Mountains is a summer music festival devoted to instructing high-level players of piano, violin, viola, and cello in solo and chamber music. Why did you choose Catskill Mountain Foundation to “grow” your school? 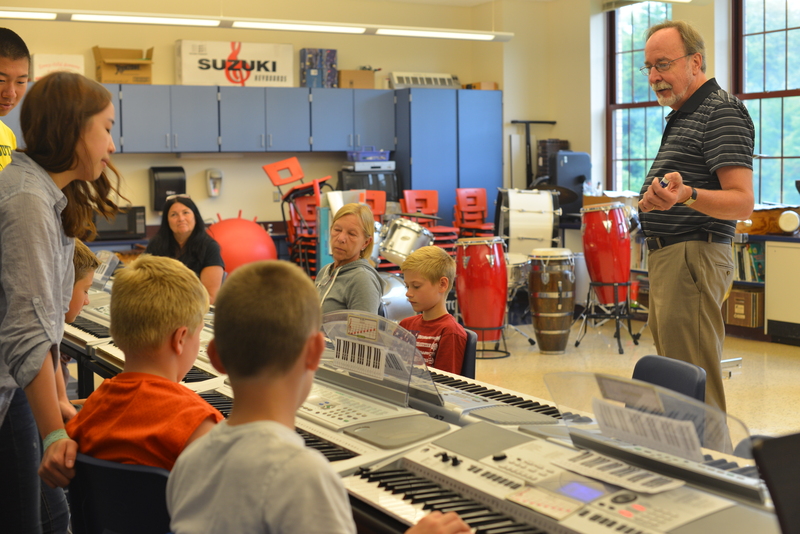 CMF offered us a beautiful rural setting, the piano performance museum, and a supportive staff of music lovers. What can MinM students expect as part of their residency? Our students get two private lessons per week, daily chamber music rehearsals and coachings, lots of time to practice, great meals, and clean mountain air. 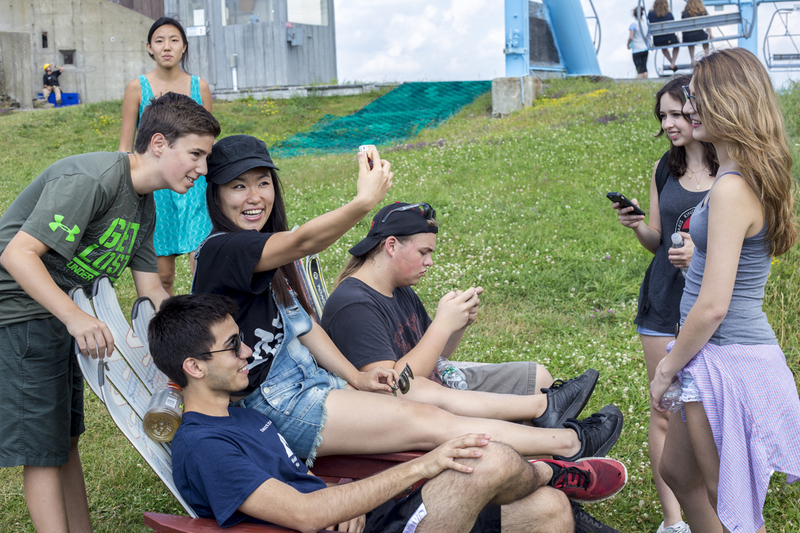 They also develop lasting friendships with other students from all over the world. What is your role as the Director of MinM’s summer residency program? I’m the MinM business manager. As such I correspond with applicants, set the daily practicing and rehearsal schedules, and take care of solving a myriad of little problems that arise on a daily basis. This year, for instance, we had a Korean student accidentally fly to Albany, GA instead of Albany NY. Getting her back on track was an entire day of anxious phone calls to the police and the airline involved. Where do you draw your students from? New York City? Other U.S. states? Students come mostly from the NYC area. But we have some from China, Korea, Florida, and Indiana this year. The Catskill Mountain Foundation’s (CMF) Piano Performance Museum has called on your expertise two years in a row to help establish CMF’s “Concerts & Conversations” series. What do you think of this series? MinM is devoted to helping make the best use of the PPM. Lectures and concerts by me and others are an important part of “getting the word out” on this valuable resource. Do you have a favorite musical period? The more you know about music, the harder it becomes to pick a “favorite” period or style. J.S. Bach was a great composer of the Baroque period, but his music is no better than that of Mozart who came to prominence in the Classical period. And neither one of these is “better” than someone like Brahms who lived in the next century. There is something to appreciate in all these great composers. For my own career, I’ve chosen to devote my research to Hector Berlioz, a 19th-century French composer. I latched onto his music because it is so wildly eccentric and extremely emotional. If you could have been anything other than a musicologist, what would it have been? A photographer I suppose. In fact I do quite a bit of professional photography along with all my music. Photography is like music. It requires both great technique and innate creativity. 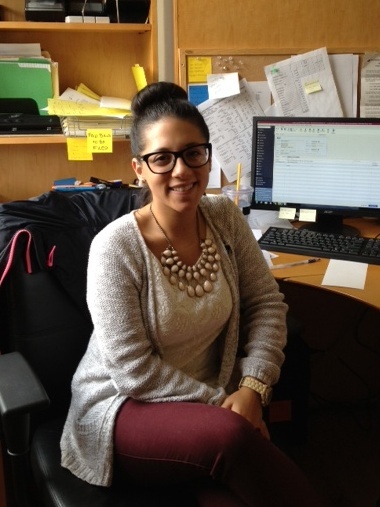 Ashley is 22 years old currently working as an Administrative Assistant at the CMF. Ashley has learned a lot about the mountaintop she grew up on and the many great offerings it has. When she is not at the CMF, she enjoys reading a good hearty novel, going for a run, watching the classic television show Friends, making DIY crafts, painting her nails, cleaning, (yes, shes enjoys cleaning), learning how to cook/bake with her dad and sister, but most importantly she loves spending time with her family and friends. Ashley hears from colleagues, friends and family that she is caring, smart, bubbly, dependable, creative, confident, fun, determined and also likes to think of herself this way as well. You were born and raised on the Mountain Top of Greene County? What town or village? Where did you go to school (elementary and high)? My best friend had told me she was interested in a Communications major and I still had no idea what I wanted to do. She then explained it more to me and the different areas of concentration that I could get into, and after researching more, I found that with a Communications degree, there is such a broad field of careers you can get into, so that’s what attracted me to the general Communications major. Then I decided to have a concentration in Public Relations because I liked the type of work that was involved and I mainly felt like I had a natural sense to enjoy the PR world. When did you start working for Catskill Mountain Foundation? Still a newbie here, I began at the beginning of June of this year. Is there anything surprising that you’ve learned about the Foundation since you’ve started working here? There are a lot! Since graduating high school and going away to college in Massachusetts, I haven’t really been involved in the mountaintop or seen much of what the CMF has been doing. So now that I work here, I got to learn more about the performances, lectures, courses, camps and films they have here,I had no idea they did so much! If you had one question you’d like to ask yourself what would it be? And would you answer it? That’s tough, but I guess it would be “what is the next big milestone/accomplishment you are looking to achieve?” and yes, I would answer it if I knew what the answer was. It almost scares me to think about that question and the answer to it has crossed my mind, but too many options and “what ifs” are in my head, I am enjoying not knowing what lies ahead and just taking a breath for a little while. Can you speak to having your beautiful harpsichord accompany you in the performance Before the Deluge: Music from Versailles and Paris? I take my harpsichord almost everywhere…so does a violinist…a flute player. It is rare that we can rely on having a good instrument at our disposal when we travel and so if the voyage is doable in a car…the harpsichord goes with me. I am fortunate to play places, far off, where there maybe a really great instrument, either one made by a fine modern craftsman or an antique. In any case, a new harpsichord to discover makes us play our music in different ways. Any fine instrument has its own voice and a player needs to learn to sing with that voice! An exciting prospect! Who are the artists (and perhaps more generally, which genres of music) outside of classical do you enjoy listening to the most? Your personal opinion on life and music in the Catskill mountains? Well I had a crisis when I moved to Craryville. On my porch I overlook a scene that comprises forrest, grasslands, and ponds. There is a large open space of conserved land and the angle allows me to see a huge canvas of sky and a Capability Brown landscape. The bird population is impressive. The sounds of the wind in the trees, the bird calls, the insects (ah the carpenter bee has a low hum that must be a sound from heaven)…the changing weather at a distance ….everything is a music here..and so much more beautiful than anything I can make on my harpsichord… The crisis was, why should I try with my stilted music when there is an endless unscripted symphony just out my front door!!! This paralyzed me for about 3 or 4 months!! Finally I have found that I can forgive my music for being what it is and no more…It is the best we humans can do and if we are smart, we might be able to fold into our phrases and movement some of the natural beauty that teases us and challenges us in the wonderful part of the world. Which non-musical influence are important to your music? Most important, love and longing. Loss and reunion. Flavors and perfumes. You know, when we are babies, the delineation between senses are not so set. A smell will excite a part of our brain reserved for sound. A taste will massage the color receptors. As we age those boundaries harden. What a shame. Lets try to break em down again. Can you give us a little biographical statement in your own words? You were born and raised in Hunter? Yes, I was born and raised here. Specifically, I grew up in Elka Park, NY. What about living here inspired you to become an artist? It was the only subject that really clicked for me in grade school. I had an amazing elementary art teacher, Ms Patchsky as well as an inspiring high school instructor, Ms Rita Mary Vining. My parents were also open to encouraging my imagination, which is still free flowing to this day. Who were your first artistic influences? Did you know much about the Hudson River School of Art when you started painting? I was relatively familiar with the school, but it was not until recently that I have learned more about the great artists that were rooted within the school. Landscape paintings have never been high up on my list of art that influences me, but as I get older I am learning to appreciate all that art is in every way, shape and form. Every piece of art work is a piece of another. The only way to entirely understand art is to understand the history of art. When did you leave Hunter, NY for the wider world? I left as soon as I could as I didn’t feel there was any other option. I went out west and studied art in Lake Tahoe at Sierra Nevada College. I moved to Hawaii and studied ceramics, Japanese and Chinese art. I lived in Denver for three years and became increasing curious about Art Therapy and took several psychology classes. All of the experiences collectively, influence all the art I create today. The most interesting subject to paint are the images my mind produces. The symbolism and different interpretations of the mind vary from person to person and being able to share the atrocious thoughts to the simple, carefree ones allows me to understand the world around me. What brought you back home? Right now, I guess I would say it was an intuitive feeling. It has been nice living in many different places, meeting lots of people and then being able to bring back and share what I have learned with my home town. I almost feel like it’s a natural part of life, or even a duty of a sort, to come share experiences with family and home town friends. There is a unique energy in these mountains and for the time being, I am fully embracing it. How does it feel to be back in your home town and working at the Catskill Mountain Foundation? I’m not quite sure how I got so lucky to find the one job that allows me to utilize the skills I have acquired while continuing to evolve and grow on the foundation of that knowledge. I am incredibly happy to be a part of the Catskill Mountain Foundation. Everyday I interact with brilliant, inspiring people who share similar passions. It also makes me proud to see how far the arts have come within Tannersville. I am proud to be a part of everything the Catskill Mountain Foundation does. If you were growing up in Hunter in 2014 and wanted to be an artist, what kinds of activities/inspiration would you want for yourself and your friends? I would encourage all to embrace every emotion and every thought; the yin and the yang of the mind. I believe anyone can discover a lot about the world around them through being unabashed and free with the art they create. I would also encourage anyone to look into all the workshops and opportunities revolving around art that are available in Hunter (which include a great amount of option!) to work with their creativity. The Catskill Mountain Foundation, as I have learned, offers a lot of opportunities for artists of all ages, so I would definitely explore that. Can you give us an introduction of who you are and what you do? I am Harpsichord, I’m a pianist, conductor. My doctoral degree is in musicology from Columbia, the study of music history and related things. Over the years I’ve done almost everything that we were told a professional is supposed to do. I play most particularly 18th century specialty… I’ve traveled all over the world, Russia, South America, so forth and all over the country. I’ve played with lots of wonderful people and with orchestras, by myself as a recitalist and conductor in various places…. I’m particularly interested in making whatever music I do come alive for the listener and to find in the composers work those qualities which are going to be exciting for us to listen to. The musical historians go back to the originals and find they should be using this instrument or that tempo or this quality or that mannerism and so forth; those things, if you don’t make them part of bringing the music to life rather than just restoring what you think was done at a certain time, somehow that kind of dies on the stage. My feeling is music ought to be alive and it ought to be constantly interesting. And of a huge range of emotion and structure and everything else from silly to profound. People sometimes categorize classical music in a certain way. Bach in a certain way; Mozart in a certain way. All of these geniuses had an enormous devotion to entertaining, stimulating and provoking public but also being satisfied the pubic nothing short of a huge range of activity. Do you hear the music in your head before you play it? How does your creative process work? I hear everything in my head ahead of time, and I think most professional musicians do. Certainly the great genius didn’t need to sound it out. Bach’s son said that Bach always figured everything out in his head ahead of time and then tried it out on the instrument. Mozart took a lot of trouble time thinking things out, including whole operas out in his head and then the process of writing it was in many ways a mechanical process, you needed to write it down before you played it. That was all figured out ahead of time in their heads and that’s the way I do it as well. I think once you can read scores, read music, you have some real knowledge of what it sounds like. Just the way…my wife reads a recipe book and she makes fun of me for this, because I can read a recipe book and I know what this tastes like, and that tastes like, but when she reads a she knows what the combination of tastes are. She can make that interpretation in her head. She doesn’t have to try it out. Although, of course, That’s the proof of the pudding. Any expert in any field knows the workings of the field very well. My idea was, it took off from this extraordinary situation in this particular location; they have a fabulous little piano museum with some beautiful historic instruments. And it was my thought to find a way to use those instruments to bring the music to life. I’m not so much interested in whether this is a nice instrument or that is, and so forth. 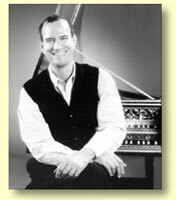 My interest in the instruments is to see what they can do for a variety of different kinds of music. And so, The period of the instruments is roughly beginning in the 1790’s and moving into the 19th century and I thought to put on a program of a wide variety of music from the 1790’s. ..The Sound of the 1790’s would give ample variety to the repertoire as well as to the instruments. Now the 1790s, as everybody knows, was a very a interesting and turbulent period not only musically but in a lot of other ways. French revolution, the American revolution, and a variety of other world changing events occurred during this time and some composers were quite reflective to these changes. Mozart was, of course he died in 1791, but he knew what was coming and could he perhaps could be considered to be one of the musical instigators of some of the modern tendencies of those days. The piece by Dussek we are doing reflects directly of the French Revolution, which is a sketch about the last days of Marie Antoinette. Dussek a famous pianist at the time, Czech pianist, was friendly with Marie Antoinette. He had to leave Paris at very short notice at one point and he wrote this sketch about essentially what her last days were like. We have amplified this by a beautiful little musical sketch by integrating some excerpts from Marie Antoinette’s final letters that she wrote which my wife will read and reread in a very dramatic and wonderful way. It integrates and you develop a much deeper feeling of what this music represents in terms of his feelings for Marie Antoinette, at some interesting angles. It doesn’t end in her death for example; it ends in, essentially, the rebels taking over. From a lot of historical points of view, this is a good thing. I think as you listen to the piece you have some real doubts in your mind about as to what the effect of this is; it’s a very interesting musical sketch. The piece, which is called, the Federal Overture was written in 1794 in Philadelphia and definitely paints a rather comedic sense of what the chaos was like in the 1790s in the United States. The idea behind the piece is to put in a little something for everybody to patch the wounds up. It’s definitely nothing profound here, but it’s an entertaining piece. What piano do you plan on using for the Dussek piece? Now for a personal question..
And how did you meet your lovely wife? She is a great singer and a great voice teacher and a great chef and a great lots of other things…We were at Columbia, she was Barnard College and I was at Columbia grad school. I was put in charge of Collegium, it was sort of the graduate students schools vocal and instrumental group. It was an attempt to get the graduate students out of the library…It was pretty dreary stuff traditionally and I decided I’m not going those. I was going to put on a Handel opera, which had never been done at Columbia and it almost had never been done in NY at all, these things are delightful. They don’t need huge numbers of people. We can do them with 6 or 8 singers and 8 or 10 instruments and I decided to do that. This was 1967. I put up a note… I’m looking for a soprano, a tenor, a bass whatever else. She showed up and auditioned for me and I said she was wonderful. 3 years later we were married and we had a wonderful 3 month honeymoon all over Europe. One month in England, one month in Italy and a month driving through Scandinavia. You will enjoy meeting her, She’s a live wire. Can you explain your fondest music memories? I’m 73 years old, so this tale would take a while but I think I’ve had a rich and very adventurous life so far. I’ve worked with a lot of phenomenal people over my career and those have been some of my happiest memories….I did a record with Josephine Mongiardo-Cooper and a couple others called Should Old Acquaintance Be Forgotten, which are original versions of all the songs you think you know. I should play you the original version of Jingle Bells which we put on this record you wouldn’t believe. We did a record called Silks and Rags, which was all ragtime dance music from the 19th Century. Someday we’ll bring that group up to the Catskills. It’s been a wild ride over the years, lots of music, lots of people, fascinating stuff. I’ve played in so many different kinds of places. Beautiful band halls, churches, schools, big concert halls all kinds of things. My particular way of doing things, I get up on stage and play anything at all, if I am convinced at all that this is not great stuff if it is not worth sharing, I don’t do it. Unless you’re paying me an enormous amount of money, no matter what I’m playing it’s my favorite piece. …The Mozart fantasy that I am going to play with my wonderful colleague, Kalinovsky a great violinist, is a subject of a reconstruction. And that’s another thing that I have done over the years; which is to reconstruct things which don’t exist, or don’t quite exist. I’ll take a second and explain this; Mozart never finished his pieces, after he died his wife hired somebody to finish a lot of his pieces so she could sell them. …I looked carefully at the sources…and noticed there were a few measures of a violin part in this piece that had been essentially left out and I thought well Mozart never finished it this way but he started it this way. Let’s see how it would have turned out if he had finished it as a violin and piano piece. I reconstructed the whole thing and it turned out to be, in my opinion a beautiful chamber piece, it’s a beautiful piano piece. I think it’s even more effective as a chamber piece. So we are going to show you what that’s like by playing that reconstruction and that’s been published by the International Music Company who has put out quite a number of my edition to things. The lecture that will be a few days before, on the 31st at 7 pm., that is going to deal with instability in Mozart…it has to do with what musically quality, especially dissonance, makes for suspense and makes for musical instability that has to be in the course of the pieces, to be resolved somehow. The lecture is devoted to and how that works and how stupid they sound if you are not aware of it. People tend to either ignore or fear it or dislike like this or that, it’s somehow, none of that is true. I would go so far to say that it’s almost a storm of prejudice. We have learned over the years that people who are not like us because of what they look like, what they talk like or where they come from or anything else…all people are worth our attention. And just because people are dead doesn’t make that less so. And we are talking about some of the most fabulous people who have ever lived on the planet who have devoted their lives to giving us wonderful things to think, laugh and cry about. There’s an immense wonderful world here which I of course would love to help people be a part of. Well it won’t happen again, I am half asleep. I am a night person. Visit Catskillmtn.org for more information on Kenneth Coopers performance and lectures. 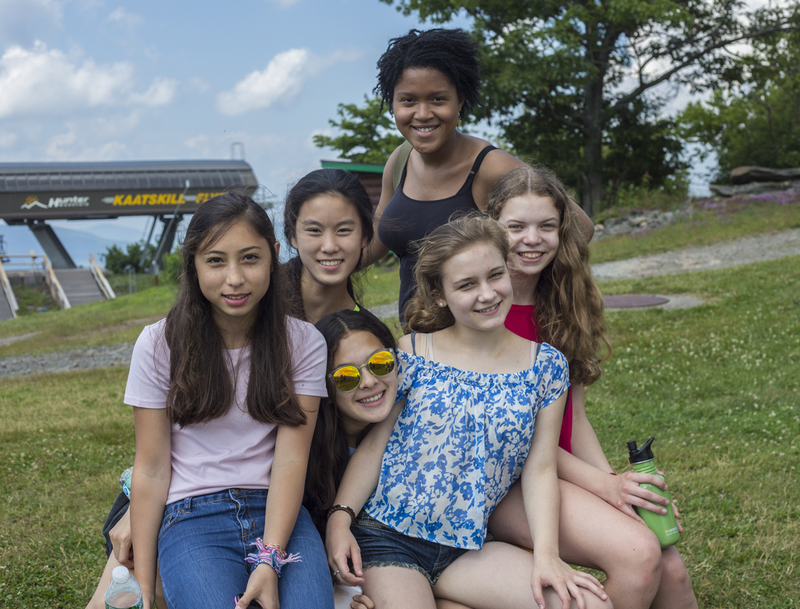 What we do at the Catskill Mountain Foundation…..
For four weeks new artists of different performing arts disciples come up to the beautiful Catskill mountains and conduct workshops with the children who are a part of the HTC CROP summer school program. For the first week, The BALAM Dance Theatre, known for its new vision of contemporary dance inspired by world dances and Balinese theatre is teaching the children. Carlos Fittante and Barbara Romero gracefully share their passion with fifty enlivened students while Mauricio Villalobos plays the violin. 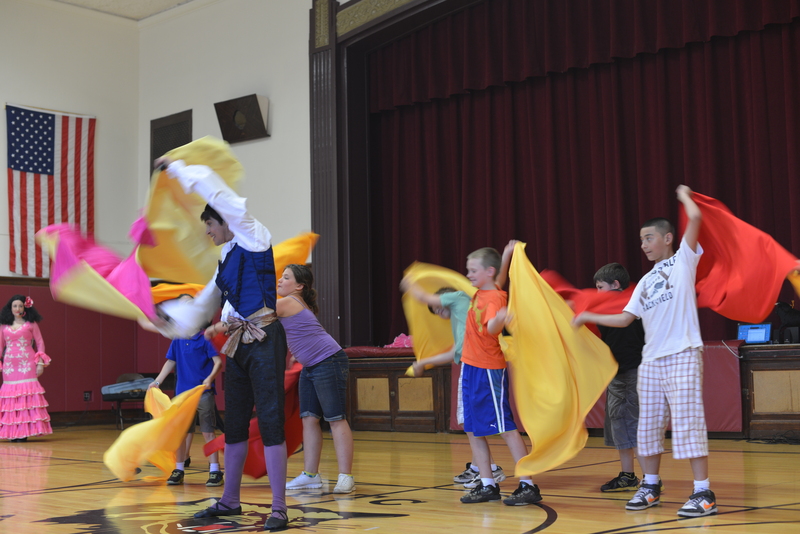 The theme for this weeks workshop is Discover the Splendors of Spain. Carlos, the Artistic Director at BALAM, enjoys the change of scenery from the NYC atmosphere and acknowledges the different peaceful energy chemistry of the mountains. 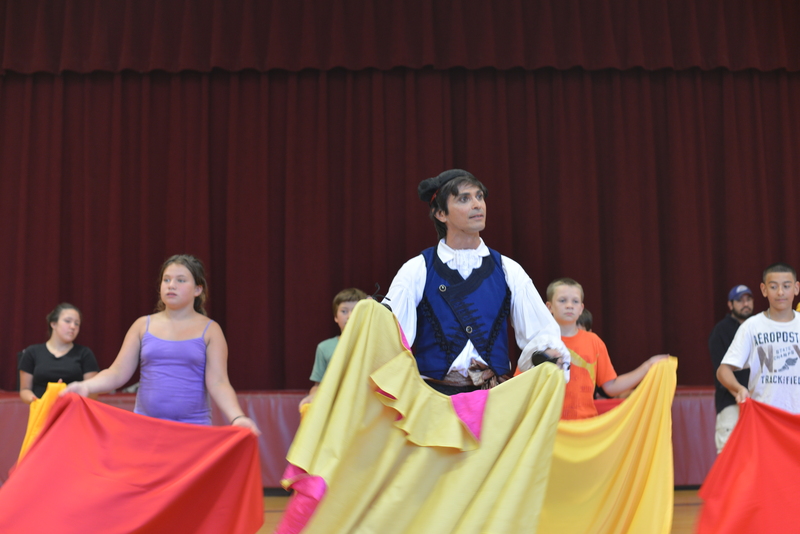 The BALAM Dance Theatre loves the opportunity to connect with the students and offer them that which they have not been exposed to before through the teachings of dance. 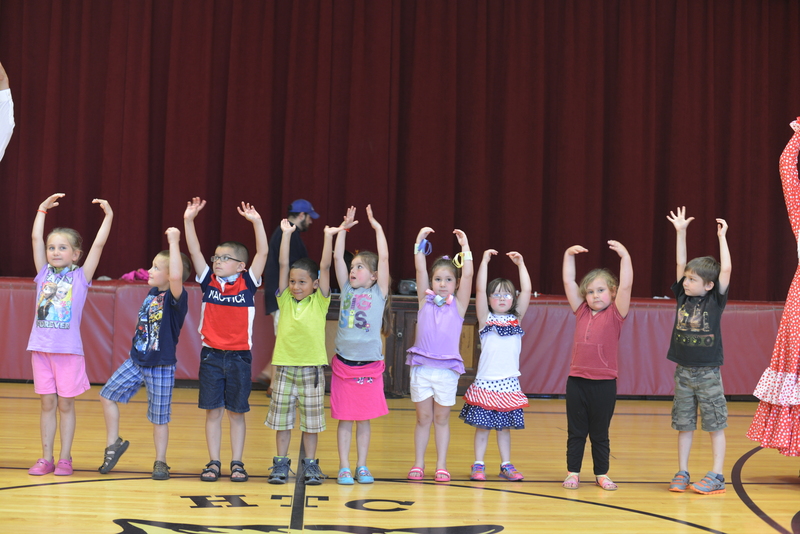 The students put on a performance at the school Friday, July 11th. 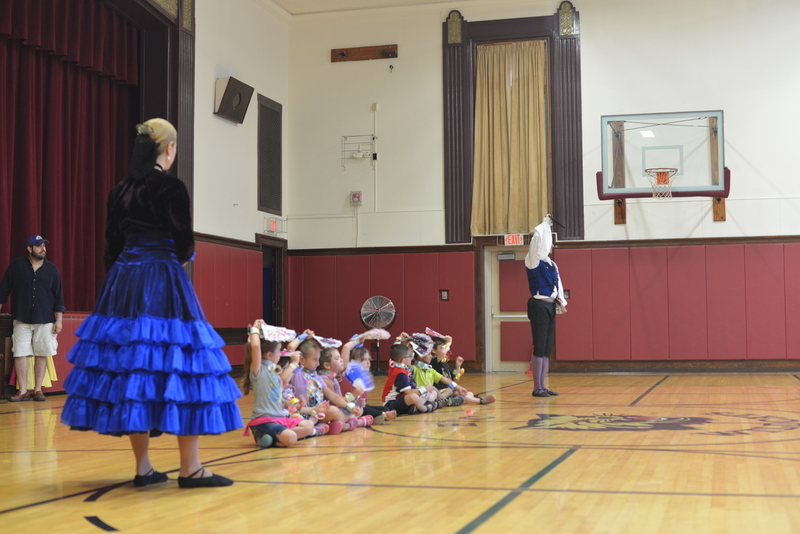 The show was open to the public and was from 11 a.m.-12 p.m., in the Hunter Elementary School Auditorium located at 7794 Main Street in Hunter, New York. 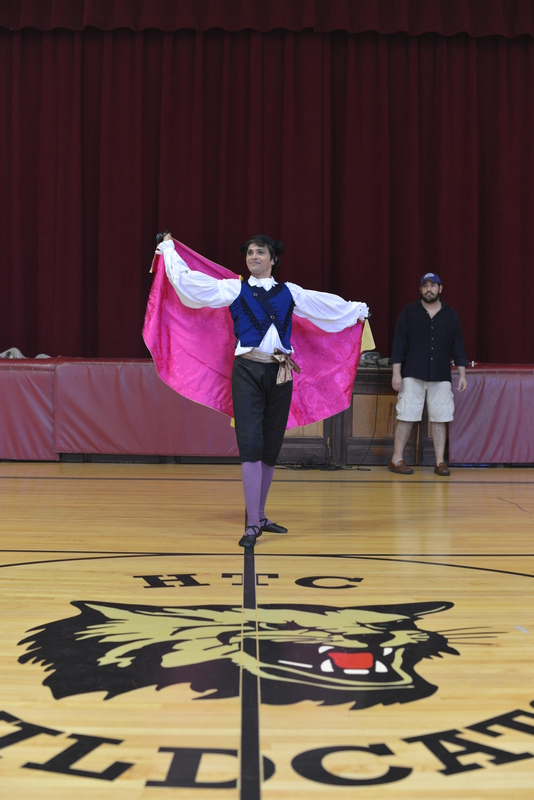 The event was the culminating student performance in one-week residency by with funding provided by the New York State Council on the Arts Arts Education Program, the Samuel and Esther Doctorow Fund, the Orville and Ethel Slutzky Family Foundation and private donations. 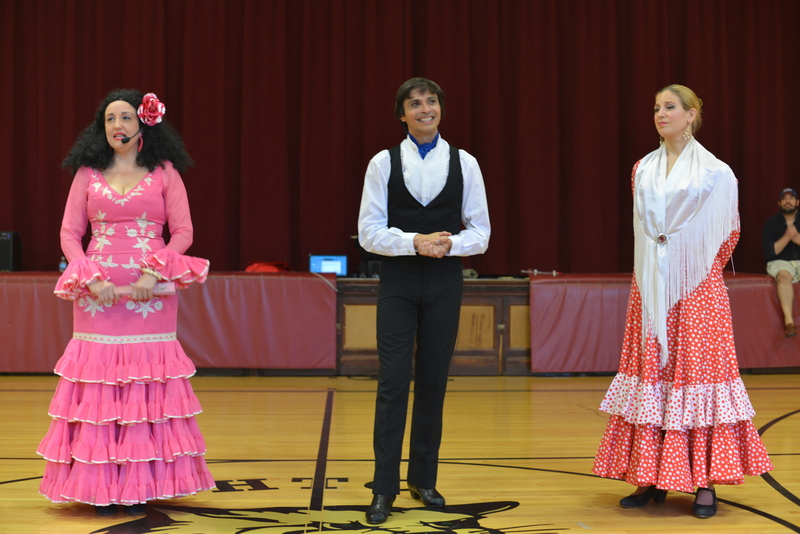 The HTC students and BALAM Dance Theatre took the audience on a journey through all of Spain. 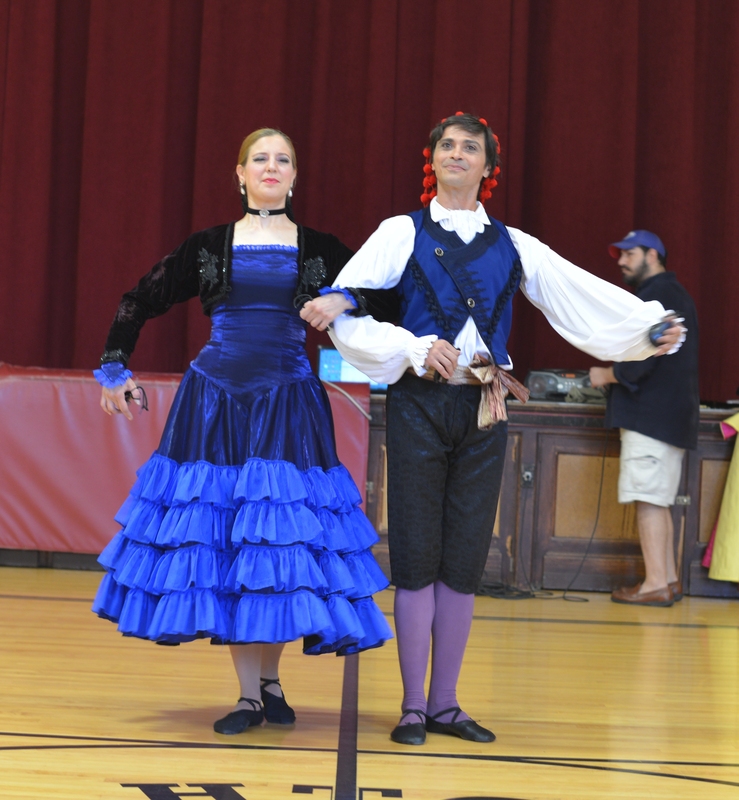 The first dance was a traditional court dance known as the Pavana. 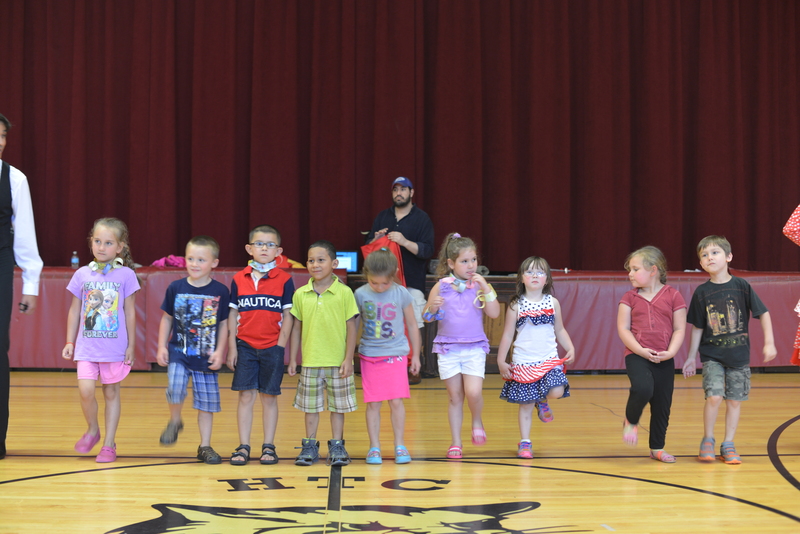 The older children looked like naturals as they all took their synchronized steps in lines and circles. 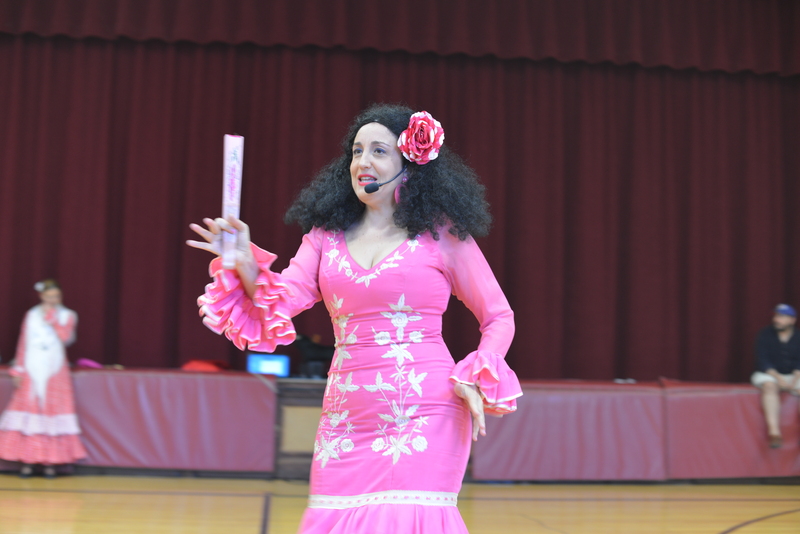 The younger children then demonstrated how the Spanish used their fans to communicate phrases like “I love you” and “Ew, that’s smelly.” BALAM Dance Theatre brought in a special guest performer, Imma Heredia. 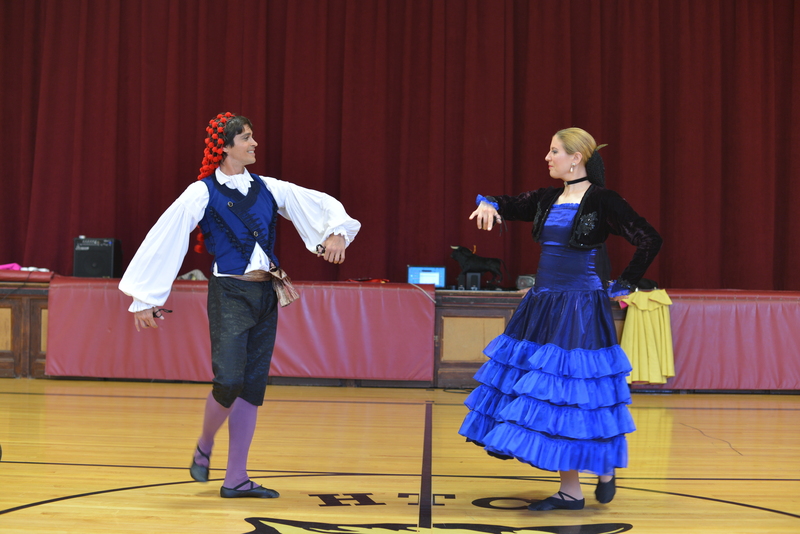 Imma danced, El Beso de Espana (The Kiss of Spain), moving into 17th century Spanish history. 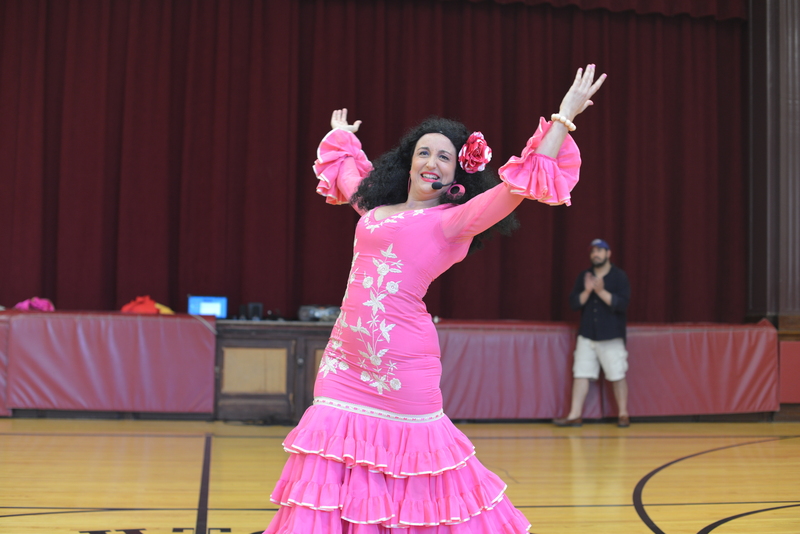 Next Carlos and Barbara traveled into 19th century Southern Spain and performed the fast Flamenco dance, Panaderos a la Flamenca. 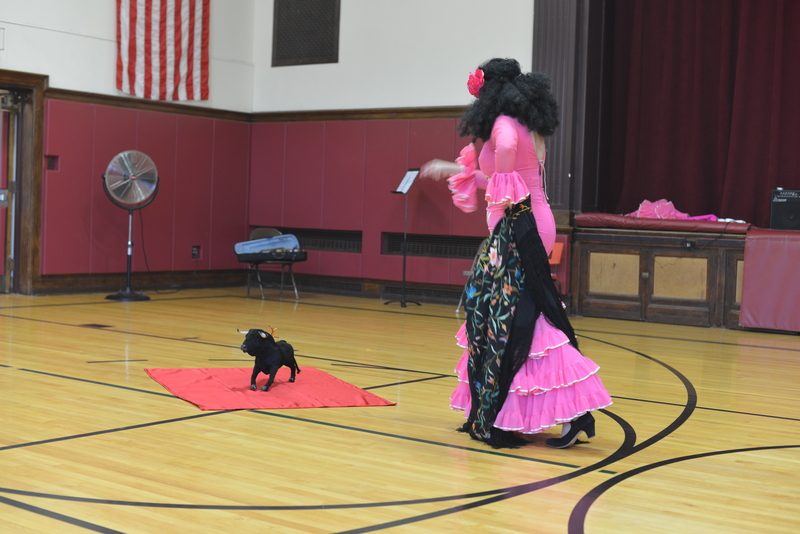 Imma danced around with Ferdinand, the toy bull, in a comedic Spanish melody, Francisco Alegre. In this melody Imma politely asks the bull to not kill her husband in a bullfight. 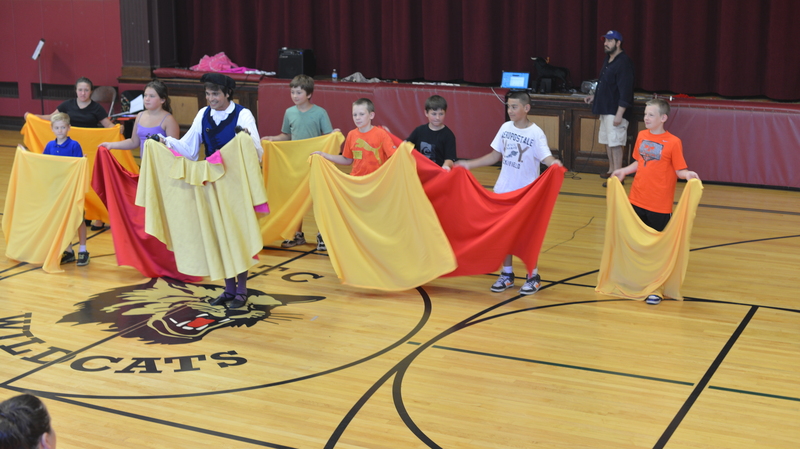 The older group of children performed their bull fight cape work in the El Taurino Pasodoble skit. All the children had capes and led a dance that certainly would have dodged and baffled any bull in a fight. 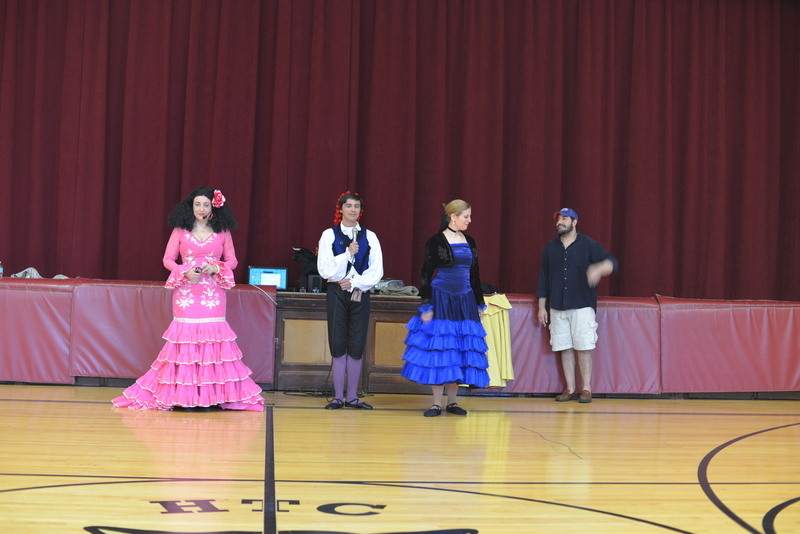 A few more authentic Spanish dances were performed by the talented BALAM dancers that finished the journey through Spain. For the last dance, two volunteer students danced to El Toro y La luna (The Bull and the Moon) while Imma sang. 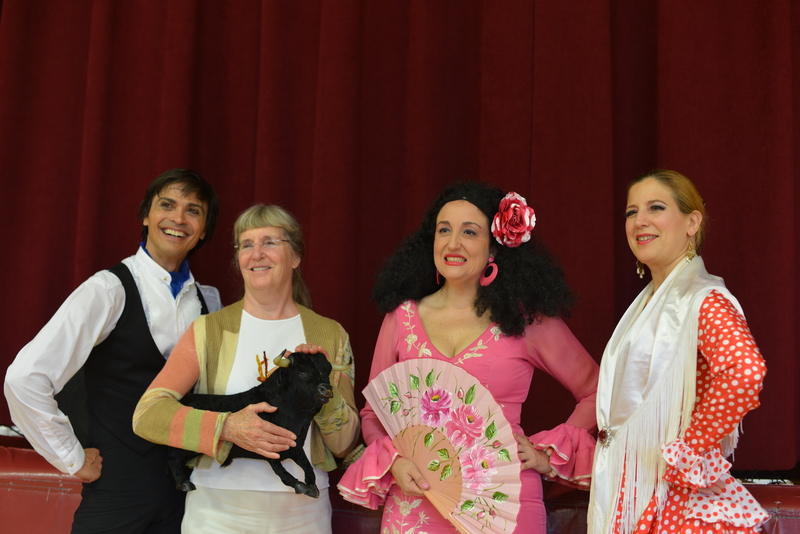 Carlos, Barbara and Imma answered the children’s questions and closed the performance. 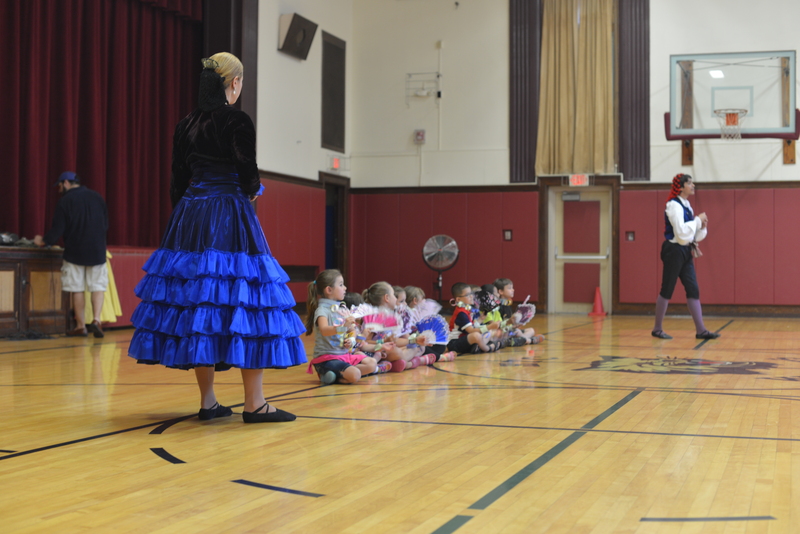 The students were engaged and asked many questions after the performance. The entire show was an impressive sample of the students hard work over the last week. Imagine the sunlight disappearing into a cave and never coming out, leaving the outside cold and dark. 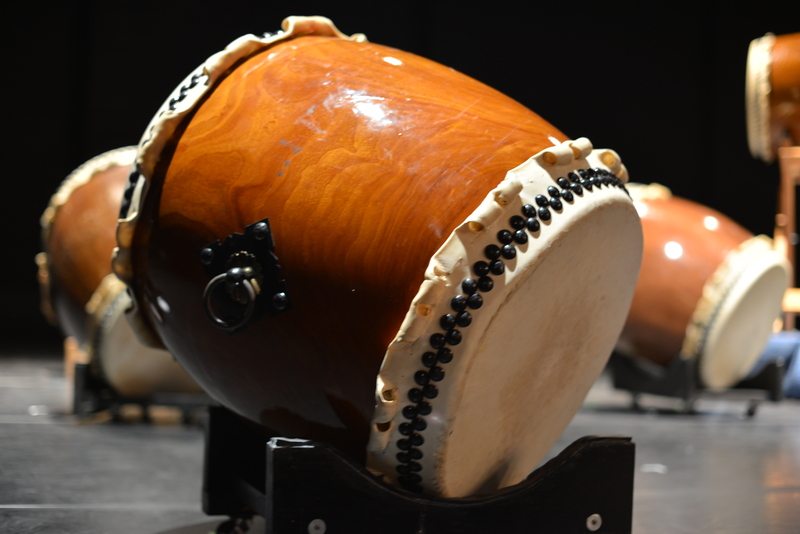 According to an ancient myth, the sounds of Taiko drums succeeded in bringing the light out of the cave and rejoining the world in the celebration of life once again. The complete mythological story involves the details of the trials and tribulations of Gods and Goddesses. The drums brought back life, depleted the anger and released the joy. 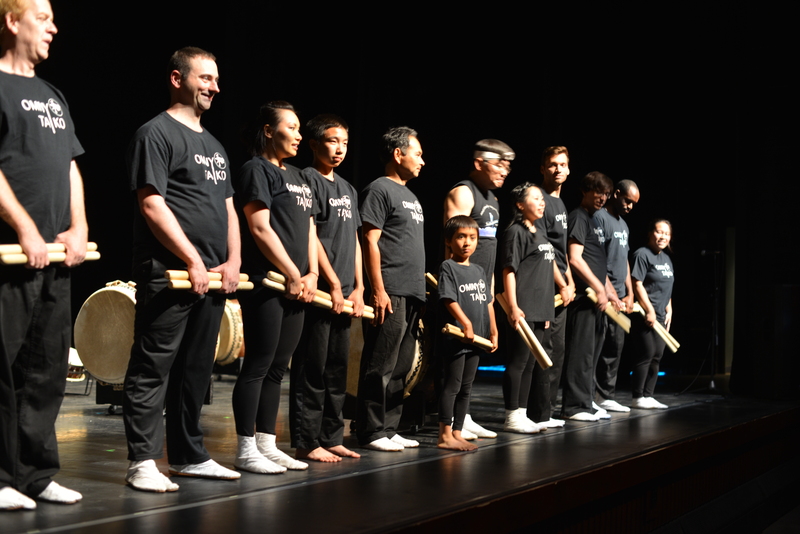 A joyous and liberating celebration occurred in Tannersville, NY at the Orpheum Theater on Saturday, July 5th, with OMNY Taiko’s members. 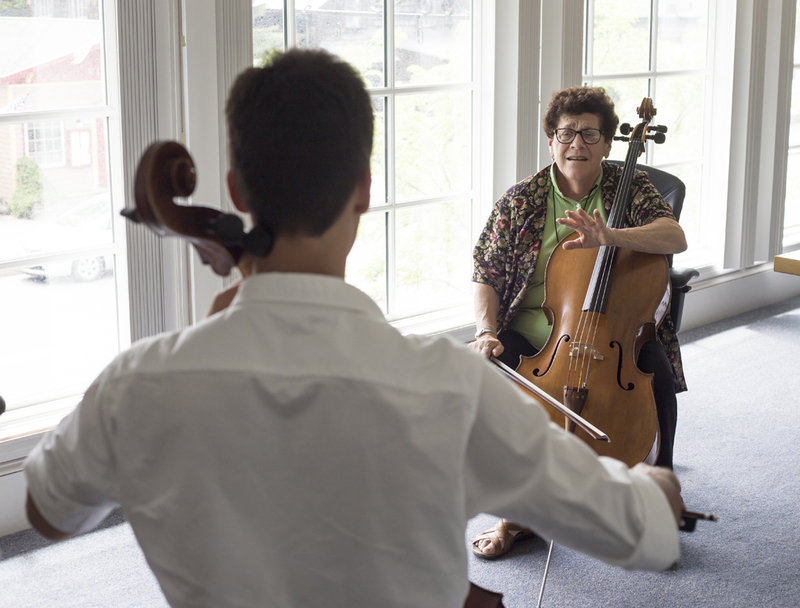 OMNY started out in a garage in Brooklyn with difficulty getting started due to lack of financial resources, and the scarcity of a place to practice in the city that did not upset the many neighbors. Catskill Mountain Foundation lent money to the group for the drums which allowed OMNY to eventually purchase their very own drums and become what they are today. OMNY, standing for One Miracle in New York is truly a statement of the gratitude the performers have from being able to become what they are today. To begin describing the experience I’ll start with acknowledgment of the notion that the beat of the drums create a physical experience connecting the mind to the fundamental life sustaining heartbeat. The first five musical instruments used by cultures throughout the world are generally that of the percussion. The sound is raw. The sound is pure. Less is more, and bigger is better in the presentation of the Taiko drums. Upon entering the Orpheum the darkness took over and the focus was on the large drums highlighted with lights. The simplicity was intriguing. As the theater filled, the anticipation rose; when the drums began to beat and penetrate through the body a story flowed up from the ground and into the heart. The performance consi sted of many musical stories, one of which included the Big Bang Theory. 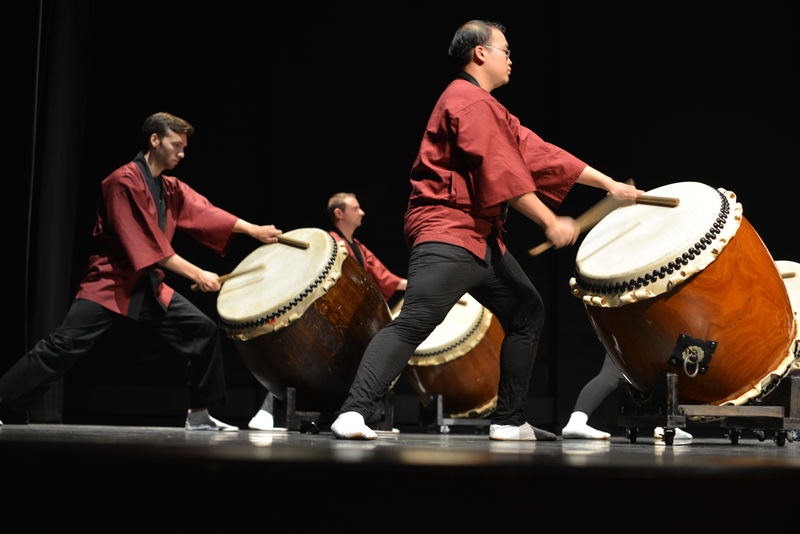 The audience was welcomed to a Asus traditional Japanese festival, leaving one with feelings of authentic connection to the beats and culture. OMNY highlighted their young artists serenading the audience with the saxaphone and violin. “Revelation” was played, a song that guided us through an adventure of order, chaos and back to order. Embracing the chaos was an essential part of the experience, while coming out on top and feeling elevated. 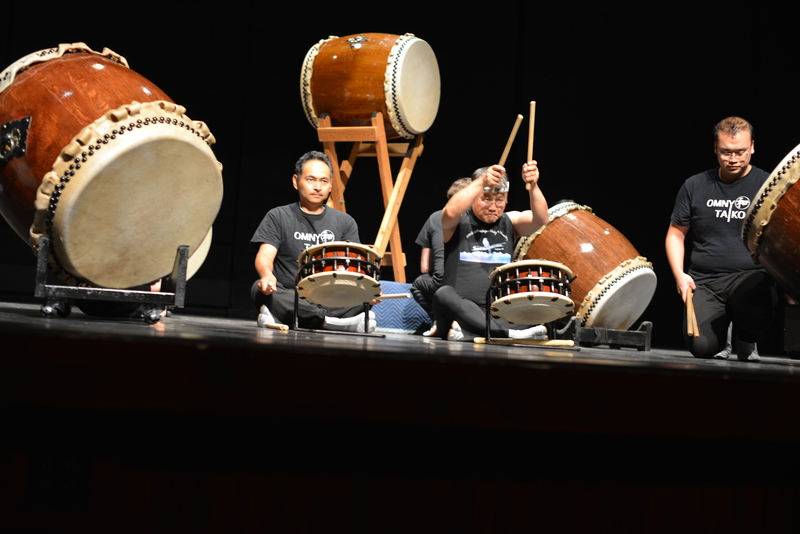 The Grammy Award-winning Taiko Master, Koji Nakamura, took the audience’s breath away doing a solo performance. He spent it pounding his heart away on a drum that lasted longer than` any bionic human could even fathom completing. Simply put, the man was incredible. The audience left with a greater sense of oneness. A grandfather explaining to his granddaughter how pure of a sound she just heard. A woman commenting on how the sounds just hit you directly in the heart. The show was powerful and left you feeling the joy of life from the ground up.